Spatial planning, as it’s known in the business, has to be one of my favourite processes when redesigning a space. This stage ultimately comes after you’ve assessed and scrutinised the brief. (A rooms purpose, who is going to use it, and how). 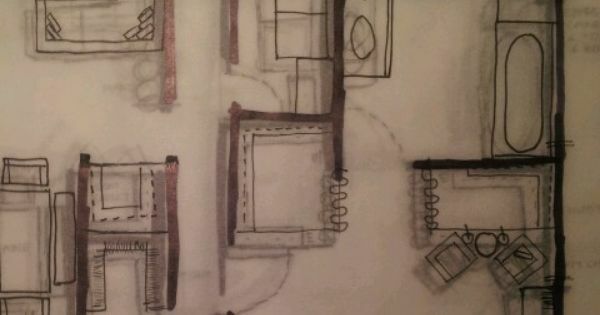 It’s brainstorming and coming up with the best solution to utilise the space to its utmost best and I love it! It’s worth investing time at this vital planning stage, and the best thing is you don’t have to have an expensive computer package to do it either. It’s also great if you’re not particularly computer technically minded. 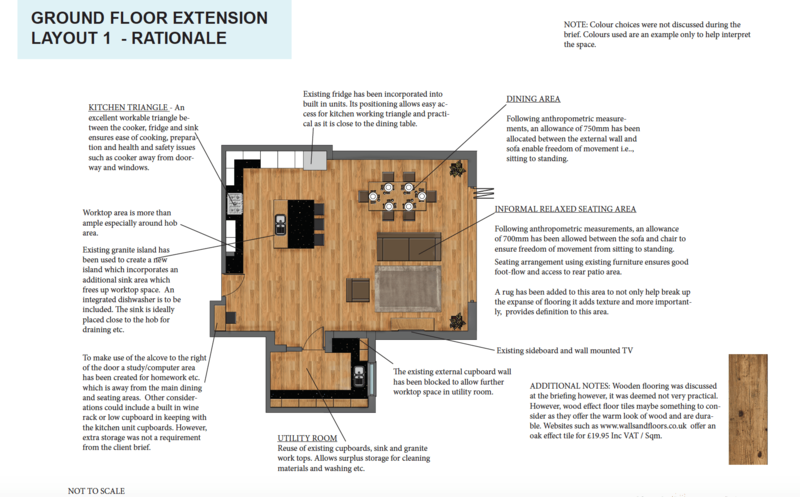 Planning where your furniture is going to go from the beginning ensures that you’ll be able to plan other design elements such as lighting, furnishings, artwork placement etc. Being forewarned is being forearmed as they say. Ultimately, it will save you time, money and keep stress levels to a minimum. 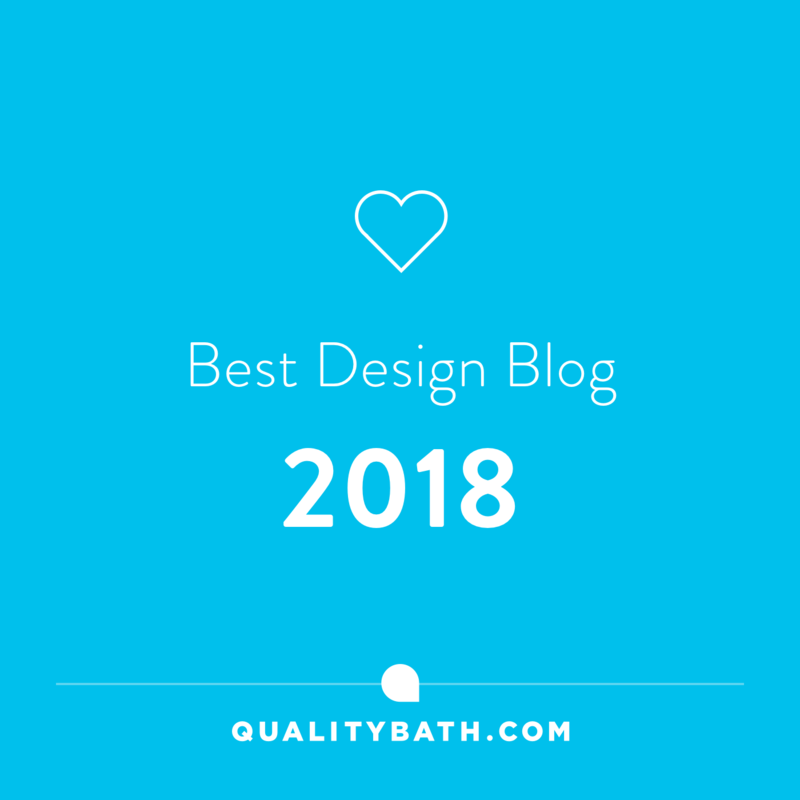 Whether you’re going for a complete redesign or not, ensuring that your current or proposed furniture choices are going to fit is the best way forward. Every room needs an area that creates a focal point. By planning the layout of a room, you can work out where you’d like to create the all important focal point. There’s nothing worse than a badly planned room where the eye is left to wander, and has nowhere to settle upon. Tip : Planning your furniture layout also helps you locate where electrics are going to be needed. Again, huge savings can be made if you know where you’re going to need those plug sockets and light fitments. Your electrician/builder will appreciate it too! Ground floor furniture and lighting plan. Yes an obvious one, but some like to guess at how big their rooms actually are. 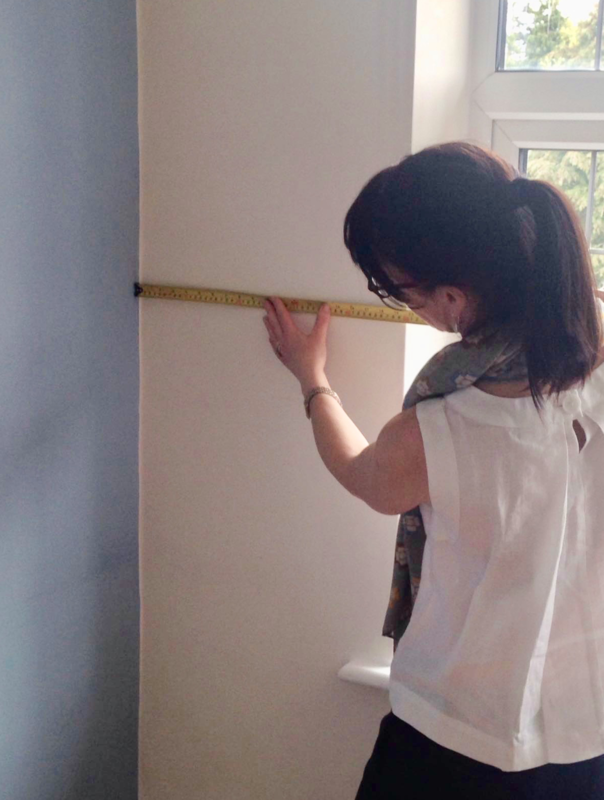 It’s absolutely essential that you take accurate measurements of the room. From the obvious such as width and length, to any built-in units. Don’t forget to measure the size of your windows and doors including the direction the door opens as this will denote where you will lose space. Make sure you include elevation (the height). Note of any wall fittings that are staying such as wall lights. These will have to be taken into consideration when planning out your room. You don’t want to plan your furniture to find the bookcase ends up being too tall and blocking a wall lamp! 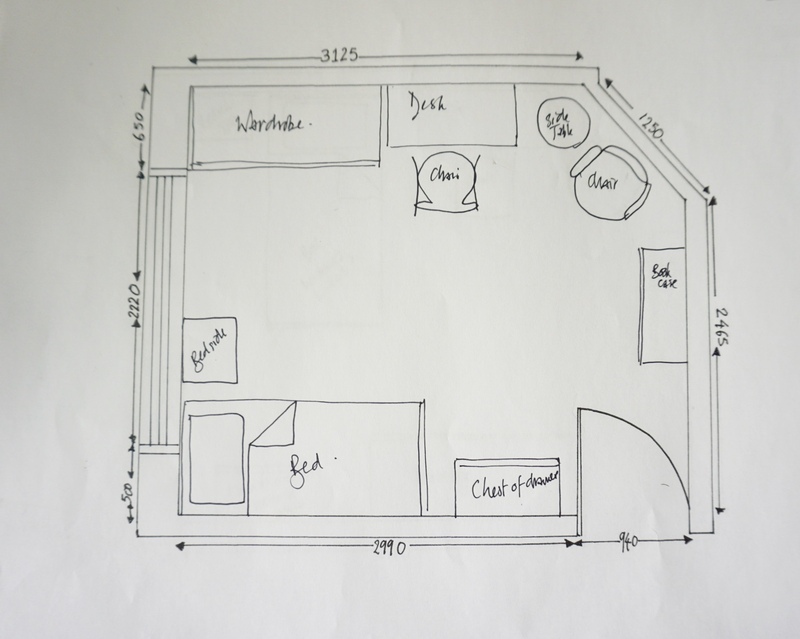 By drawing your floor plan you will get a better understanding of the rooms fundamental shape, and where you might need to give consideration to. Such as the space between windows, as well as the window size for elevation drawings. Draw a rough floor plan with all its dimensions including an elevation drawing of the window area and radiator. For me the scale rule wins hands down! Then redraw to scale. A scale rule is a must if your going to make sure the layout of the room is going to work. (Designers tend to use a scale of 1:50 or 1:20. For example, if a drawing has a scale of “1:10”, anything drawn with the size of “1” would have a ‘real’ size of “10” in the real world, so a measurement of 150mm on the drawing would be 1500mm in the room). If you don’t have a scale rule then use some graph paper and set a scale like the one below. 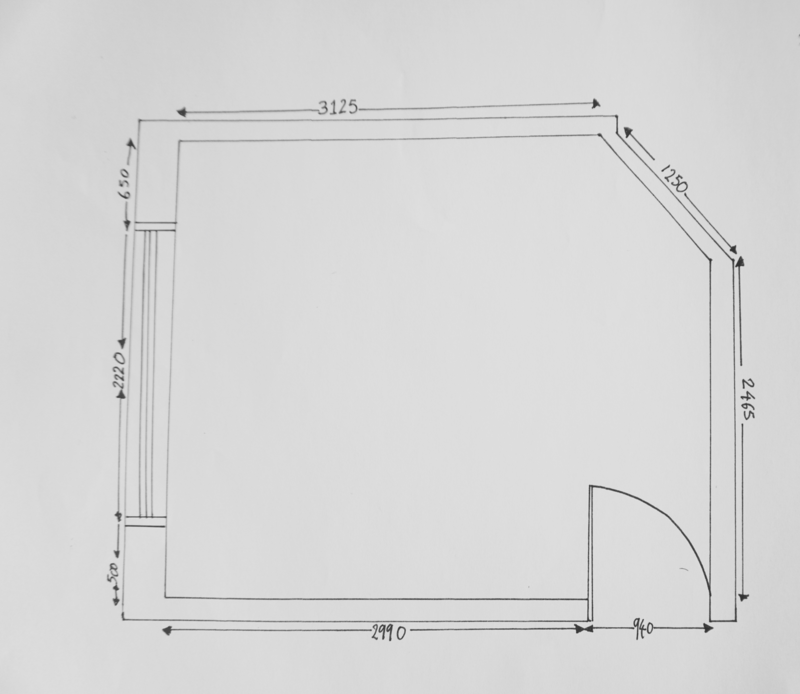 Hand drawn to scale floor plan with dimensions. 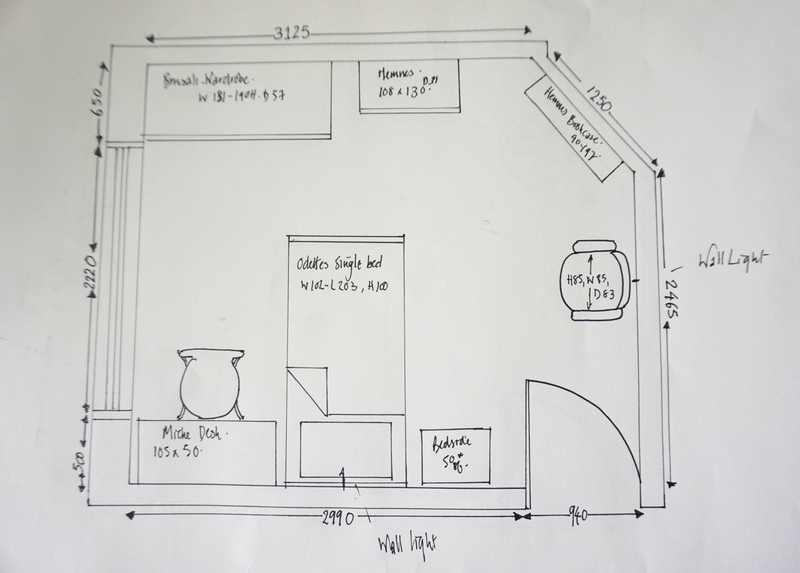 Make sure you do write down each measurement on your drawing to use as a visual guide for adding your furniture layout to. 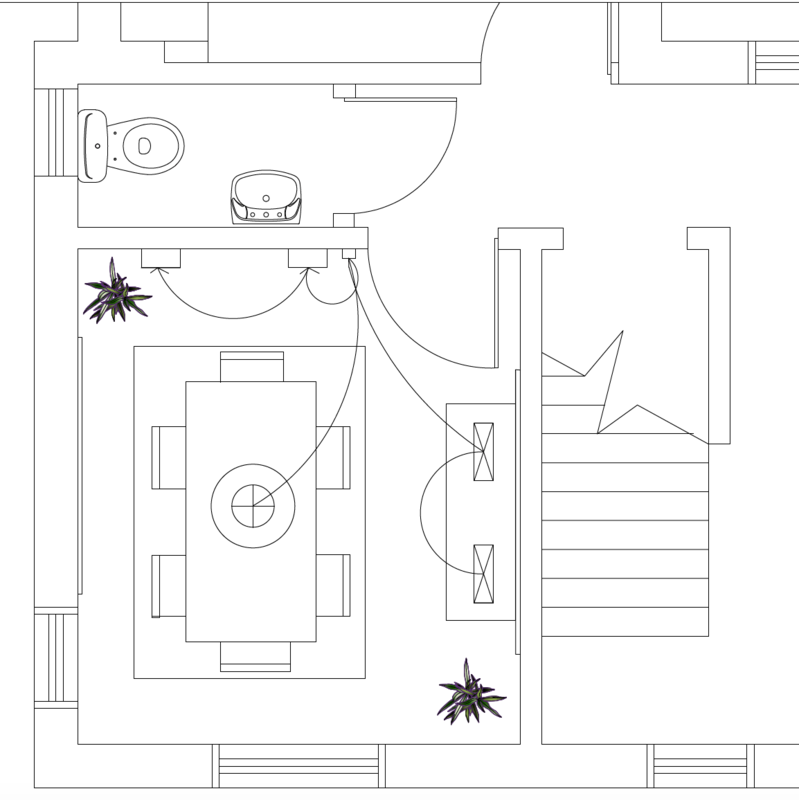 Once you’ve drawn your floor plan to scale, you don’t really want to be drawing it again. There are a few ways you can get around this…. 1. By placing a piece of tracing paper over the top of your master floor plan, draw out each layout on a new piece of tracing paper. 2. 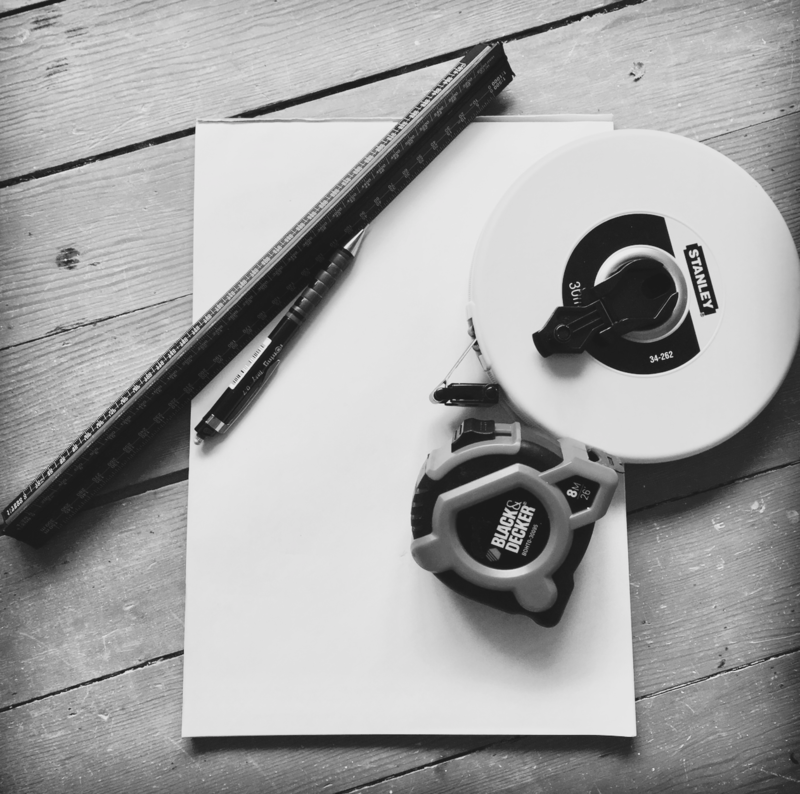 If you have a printer that has a copy function, copy your master floor plan several times. (This is my preferred method as I prefer it to tracing paper as layouts are clearer and you have a hard copy of each layout). You can use each copy to draw directly onto to create a different layout. 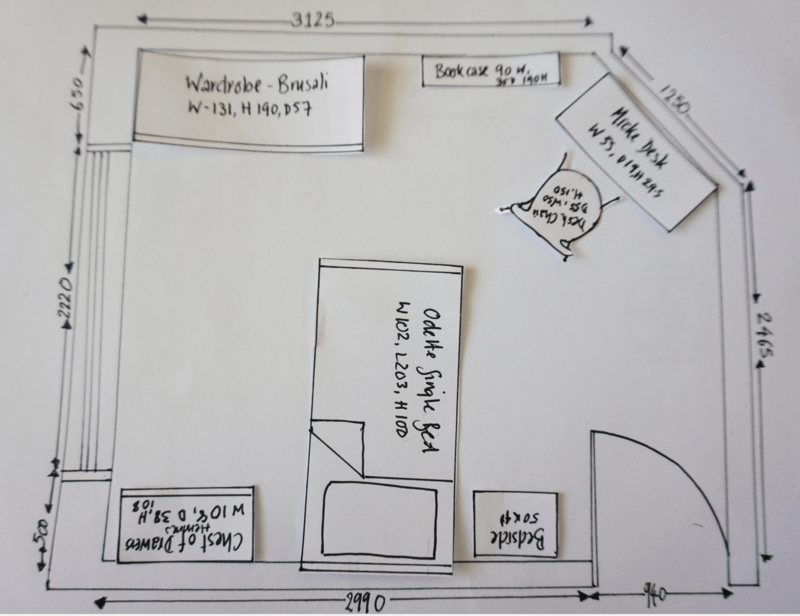 Initially you may just want to roughly sketch some layouts to give you an idea of how to use the space. I actually love this part. TIP: You need to ensure that you allow space for opening furniture such as wardrobes, draw units and cupboards. 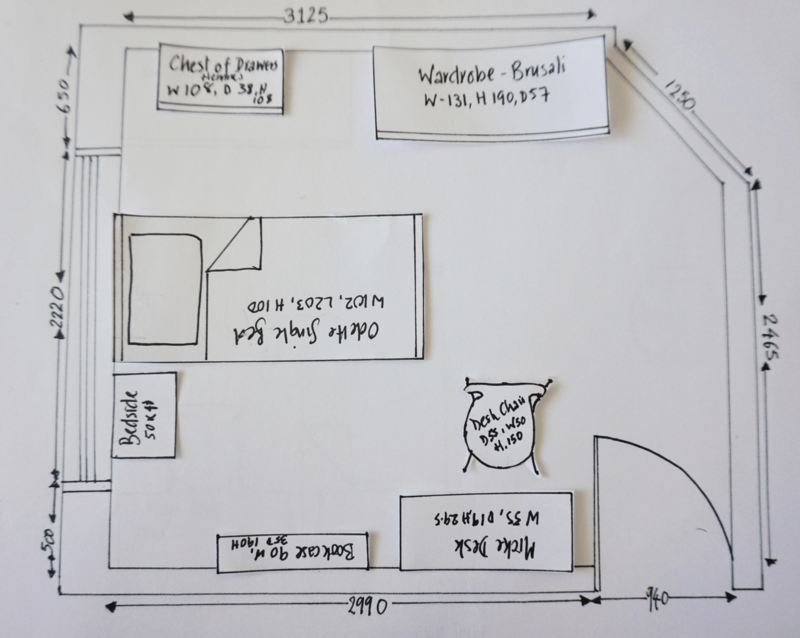 Rough drawn furniture layout using a copy of the master floor plan. 3. Another method is to draw and cut out furniture pieces that you are going to use. If you loved Blue Peter as a kid, you’ll love this method although there’s no sticking or glueing involved. This may see like a major task, but to be honest once you’ve drawn and cut them out, that’s it. If you’re going to choose this method, it’s a good idea to take a photo of each layout as a record for comparison purposes. 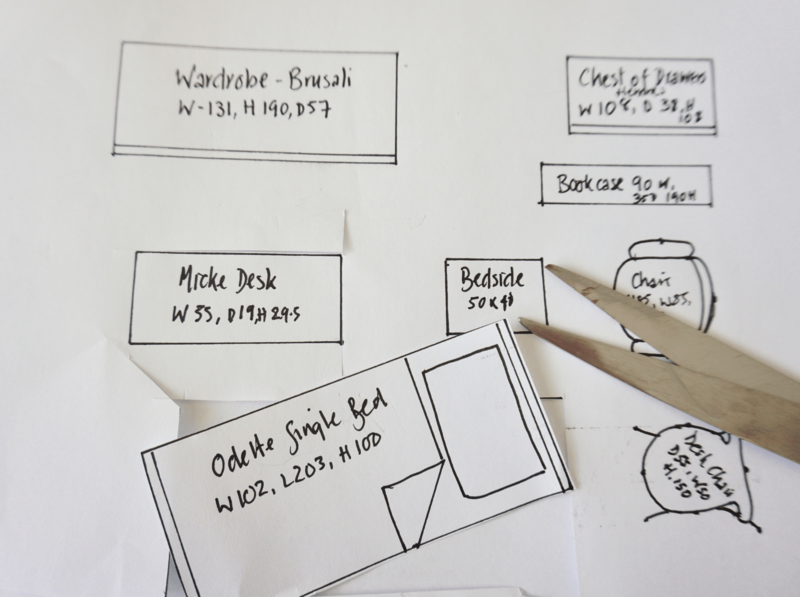 Measure and draw each furniture piece onto a piece of paper. 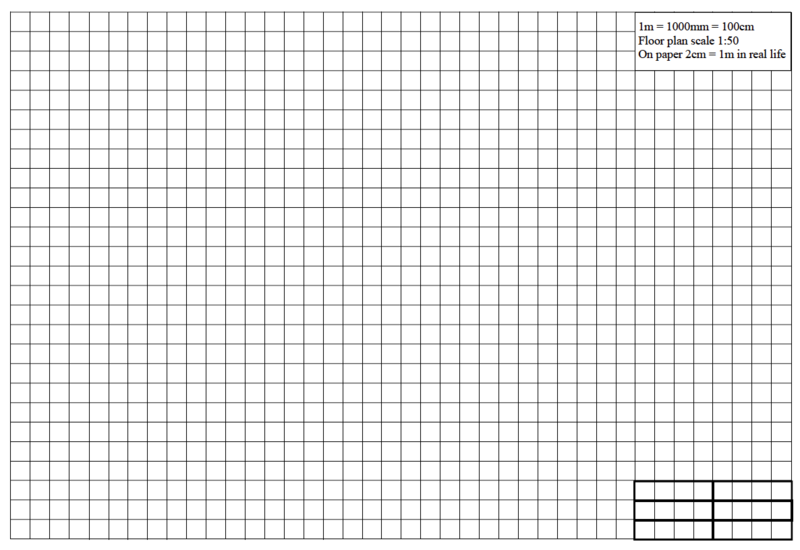 You may wish to use graph paper to help with the scale if you don’t happen to have a scale ruler. Carefully cut out each furniture piece. 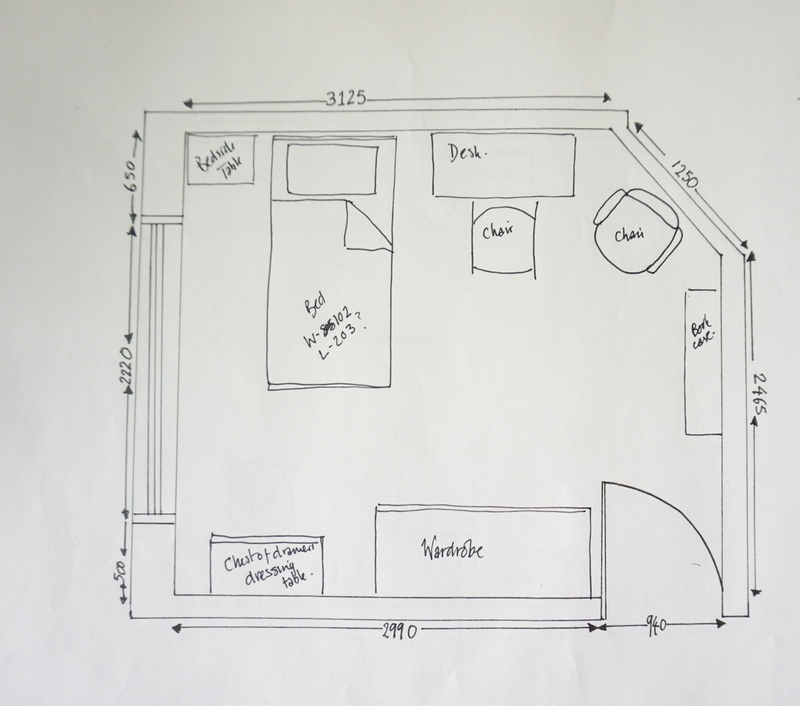 Place your furniture pieces on top of your master floor plan to create different layouts. 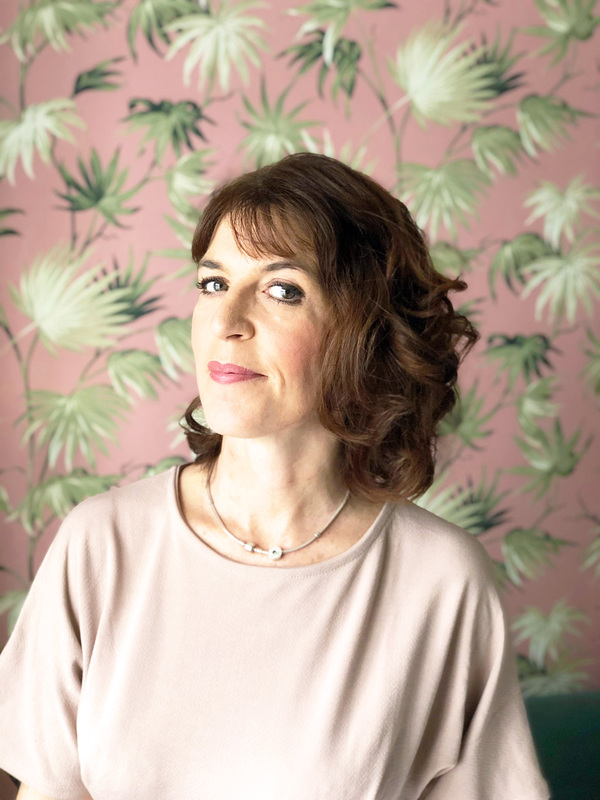 Whatever method you prefer to choose, once you have a layout that you’re happy with, you do need to double check to see if the furniture is going to fit, especially if you have roughly drawn your furniture to size. 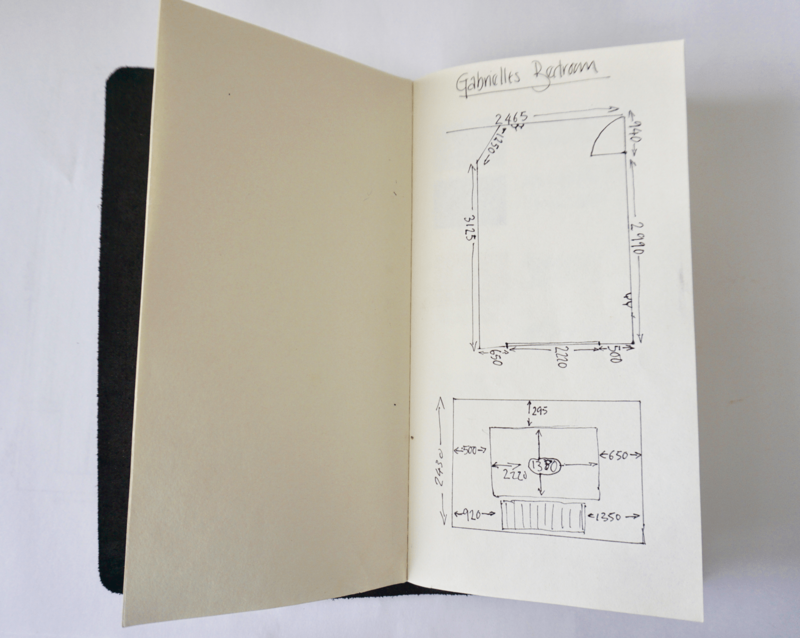 A note-book with dimensions of proposed furniture pieces the client wanted to use was used to ensure that the furniture pieces fitted the final proposed layout. 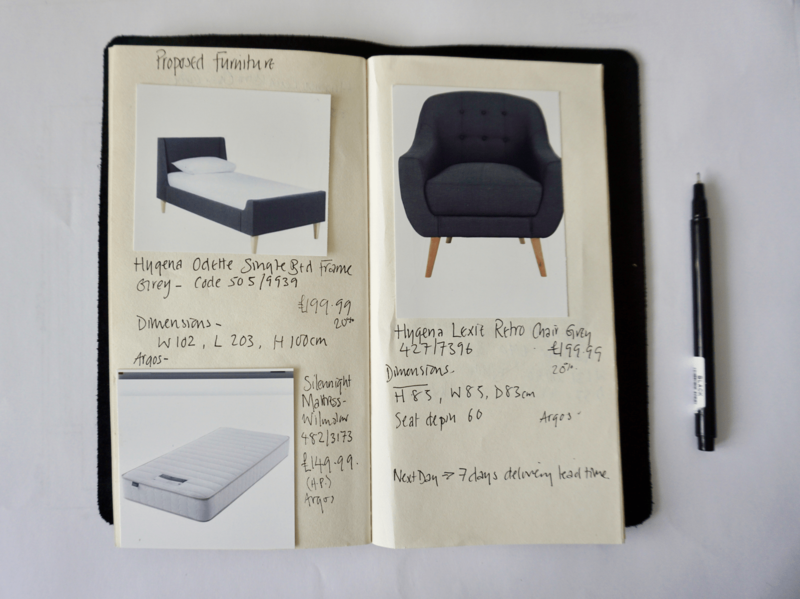 It’s good practice to make a note of any dimensions of existing furniture that you have that you may be reusing in the space. If you’re doing a complete redesign including furniture pieces, you may not have chosen or even know any dimensions at this stage. Don’t worry, lots of furniture comes in standard sizes such as beds, sofas, dining tables etc. This is just an initial planning stage to see what works, and where within the room so don’t stress too much. You can find standard dimensions of most furniture such as beds on the internet. 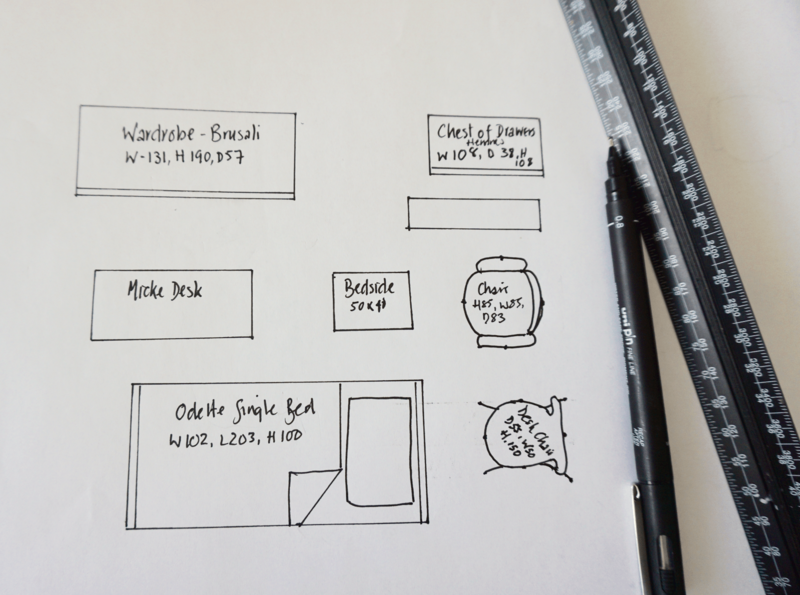 Tip: If you are using standard furniture measurements, make sure you write these down on your final chosen proposed layout. This will help when sourcing furniture as a guide. You’ll also have a permanent record to revert back to. 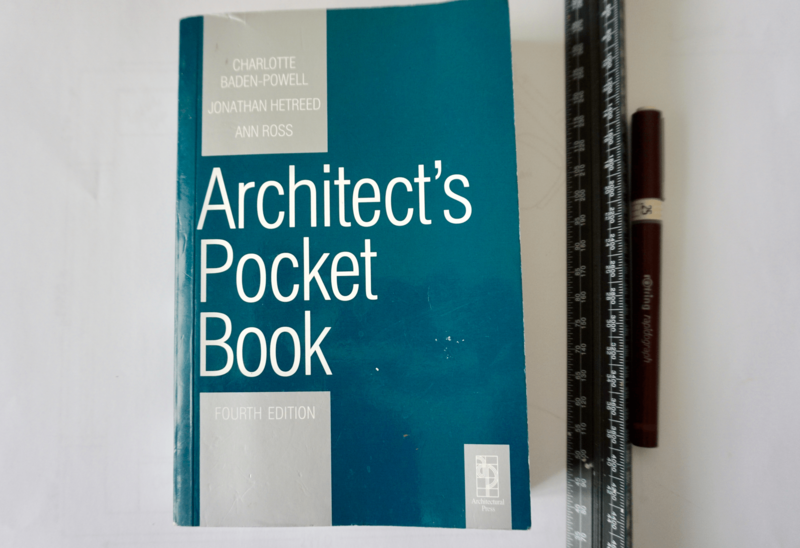 A really helpful guide to standard measurements is the Architects Pocket Book by Charlotte Baden-Powell, Jonathan Hetreed & Ann Ross. 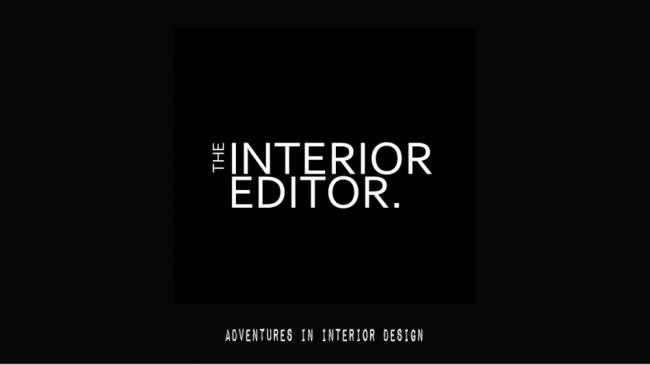 It’s been an invaluable book during and after my Interior Design degree. Amazon sell it here. Of course it’s not just about measuring out furniture to make sure it fits, it’s also about whether you’ve enough room to move around a room. Whether you’ve got room to stand and sit from a dining table to having enough leg room whilst sitting on a sofa or chair. 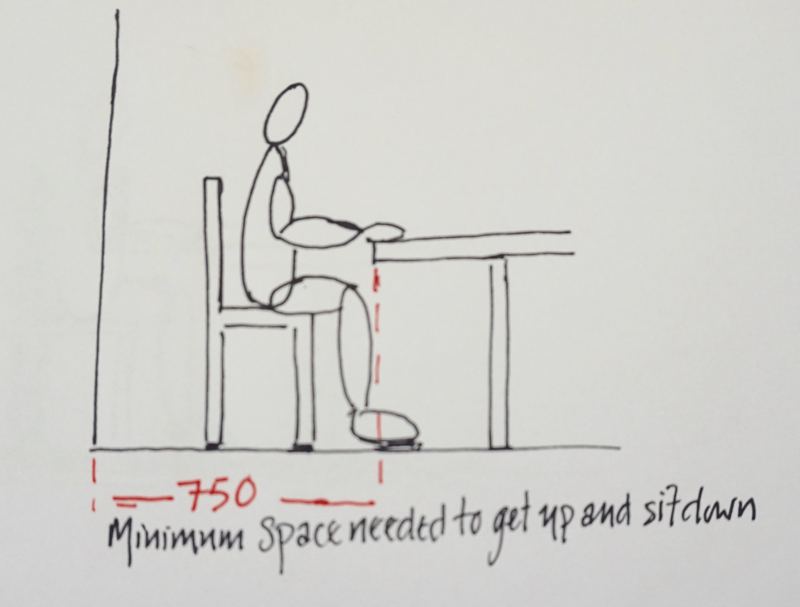 These measurements are called anthropometrics and are based on the average size person at rest, and when using chairs, tables, beds etc. 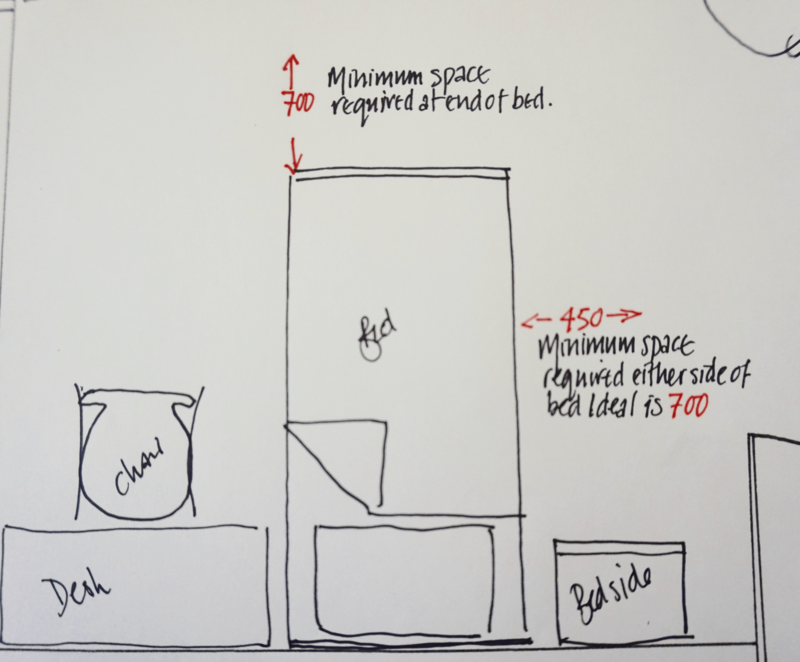 Minimum space around bed ideal is 700mm – for making bed and manoeuvrability. Make sure you have enough room for manoeuvrability around the room as well. 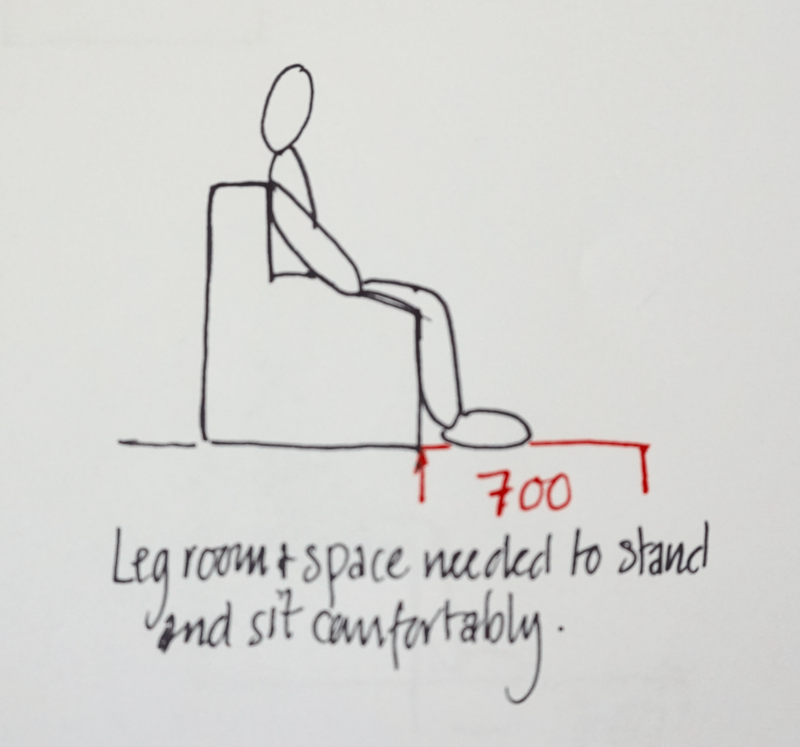 Ideally you should allow around a minimum of 900mm for a single person moving through a room between furniture. Also try to think of window access and keep doorways clear for ease of access. Oh and don’t forget drawer openings and cupboards as well as internal doors opening up into a room. Finally with each layout write down the pros and cons so that you really get an understanding of what does and doesn’t work in your space. It’s a good way to reflect and really analyse the way a room works. Until next time, thanks for taking the time to stop by the blog today! A well-written article, thanks for sharing this post.